TV show dates: October 1, 2018 — present. Performers include: Cedric the Entertainer, Max Greenfield, Sheaun McKinney, Marcel Spears, Hank Greenspan, Tichina Arnold, and Beth Behrs. From creator Jim Reynolds, The Neighborhood TV show follows the friendliest man in the Midwest, as he and his family move to Los Angeles. Not everyone in the new neighborhood looks like them, and the old-timers are more reserved in their neighborliness. When Gemma Johnson (Behrs) lands a job as an L.A. school principal, she, her husband Dave (Greenfield), and their young son, Grover (Greenspan) leave behind their small Michigan town for an new community and a whole new world. A good-natured professional conflict negotiator, Dave is naturally friendly and extremely outgoing. 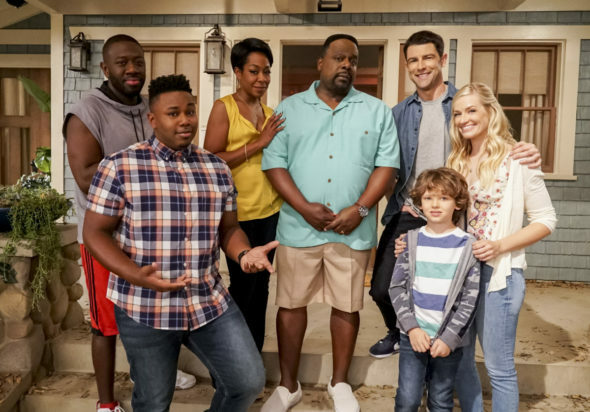 Meanwhile, their opinionated next-door neighbor, Calvin Butler (Cedric the Entertainer) is generally suspicious of outsiders and is specifically concerned that the Johnson family will mess up the community’s dynamics. Fortunately for Dave and Gemma, Calvin’s wife, Tina (Arnold) is far more gracious and does her best to make the new family feel at home. Calvin and Tina’s younger son, Marty (Spears) is a cheerful kid, who thinks the Johnsons bring something positive to the block. Likewise, his unemployed big brother, Malcolm (McKinney), feels like Dave may just understand him. It’s not always easy to fit into a brand new neighborhood, and Dave knows this is one tough nut to crack. He decides he must find a way to forge a connection with Calvin, if he and his family are ever going to fit in. What do you think? Do you like The Neighborhood TV series? Should this CBS TV show be cancelled or renewed for another season? Seriously, that’s even a question? This show is a riot, finally, a comedy on TV! The stereotypes is the show…everything is fairgame. If people start complaining about every funny issue..they would start calling it life. Too much reality is already clogging up TV…which is why with a million channels to choose from people have to too much to criticize and not enough to laugh about. If you don’t like it..change the channel….go on GOOGLE entertainment besides Trump nothing else is as funny. I really like this show! However, in the “Yard Show” it had a political reference. I’m an Independent voter and don’t appreciate. I’ll continue to enjoy the show however will stop if it occurs again. Too many shows to watch to be influenced by actors. I found this show refreshingly funny. I though the writing was spot on. My husband and I came across the Neighborhood a few weeks ago and we are hooked! Max Greenfield and Cedric the Entertainer make a great team and seem so natural and funny. Hoping this one gets renewed! I totally agree with all of these rewiews. My husband and I love this show. The cast has a natural delivery of lines, instead of so many other sitcoms with over delivery of lines. We really hope this show is around for the long haul! There are very few entertaining shows to watch anymore.